Combines greatest elements from multiple games. Uniquely combines the greatest elements from multiple games. Engineered with maximum tension to generate great bounces. Quick attach net assembles in minutes. 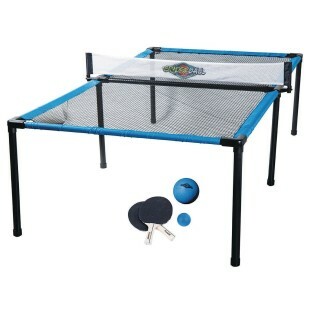 Play with your hand with the larger inflatable ball or with the included paddles with the smaller foam ball. Reversible leg stake and cap design allow this table to be used for indoor or outdoor play. Comes ready to play with 2 paddles and 2 balls. The table is 8’L x 4’D x 32”H. 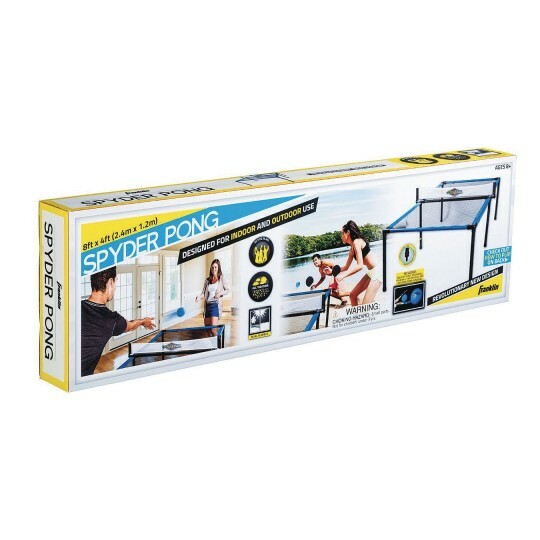 Includes Spyderball foam ball, two paddles and inflating pump with needle.